Over the past few months my main focus has been on writing my new book; and I’m pleased to share that I’ve almost finished. As I’m currently working on the Leadership chapter I thought it would be fitting to share some of that this month. Regular readers of this blog will know I believe choosing to walk the Balanced Leader journey is in itself an act of leadership. Rejecting the stereotyped notion that leadership is all about employer first and work-life balance last is a pioneering move. When we make it we become thought leaders and role models for the people around us. So what do I mean by Balanced Leadership? I’d like to tell you about three people whose academic work has influenced my thinking, writing and coaching. I’ve mentioned them in previous posts so they won’t be strangers to you. The first is leadership expert Professor Beverly Alimo-Metcalfe. I first wrote about her here. Unhappy with the ‘heroic’ and ‘charismatic’ models popular at the turn of the century that – according to her – were the result of “white men studying white men” she developed an alternative. Her Engaging Leadership model is deliberately inclusive of ethnicity, gender and other characteristics of the wider population; and does not discriminate in favour of particular leadership styles. It’s a model that’s been adopted by many public sector organisations in the UK and is increasingly spreading to the private sector. Why do I like this model? Quite simply: because the focus is on how leaders can elicit extraordinary performance from their team by focusing on behaviours that engage people. And engaging people is something women tend to be good at – so it plays to our natural strengths. My second influence is Stew Friedman. Stew has been running the Total Leadership programme at Wharton Business School for many years. He’s developed a process for achieving ‘four way wins’ – at work, at home, in the community and for yourself – acting on the three principles of being real, being whole and being innovative. Again I like this model because I believe it both speaks to women and draws on their strengths. It’s widely acknowledged that women want to be authentic – or ‘real’ – at work; and that they want to be able to focus on balancing their whole lives rather than sacrificing one part for another. And I know it’s also a growing desire among men – particularly younger fathers who would like to be more involved parents. Thirdly, I’ve been heavily influenced by the work of Herminia Ibarra and I wrote about her latest book ‘Act Like a Leader, Think Like a Leader some time ago. Much of her work focuses on how we create our workplace identities and she has come to understand these rarely arrive fully formed. We typically need to grow into them. As I mentioned in the earlier blog post those of us who’ve become parents will recognise the truth of that. We feel our way into new behaviours, act in different ways and become the people we come to see ourselves as being. That’s true whether we’re talking about being a parent or being a leader. It should be pretty obvious – based on the above – why I like Herminia’s work. But there’s more. As we feel our way into new workplace roles she suggests we should also be more playful with ourselves and our identity. I consider this to be very useful advice. When we’re playful we don’t take things so seriously. We feel we’ve less to lose. So we can try on different leadership qualities; see which ones suit us and discard the rest. And that’s it. Three respected academics whose work is influencing new ways of thinking about leadership more relevant to the 21st Century – including my Balanced Leader model. International Women’s Day falls in early March and this year’s theme was #PressForProgress. From the moment they entered the corporate world in large numbers – back in the 1960s and 1970s – women have been pressing for progress at work. And yet they still face the same challenges: working practices structured around men’s career patterns that make it impossible to combine a senior role and caring for family. And corporate cultures that pay lip service to supporting work-life balance while penalising those who actively seek it. Those pioneering women showed courage when they pressed for progress. They challenged notions of how work should be done and gained concessions such as term-time working and job-share. Fast forward fifty years and the business case for gender balanced organisations is well documented. We’ve been waiting for our employers to act; and little has changed. ‘Total” because it’s about the whole person and ‘Leadership’ because it’s about ‘creating sustainable change to benefit not just you but the most important people around you. This feminine approach ties in well with emergent thinking about leadership not as an act of heroism, but one of serving and enabling others to display leadership themselves. It is not about being an extraordinary person, but rather an ordinary, vulnerable, humble, accessible and transparent one. Choosing to become a Balanced Leader is an act of courage that will change our lives and those of the people around us. We all have the capacity to make that choice. 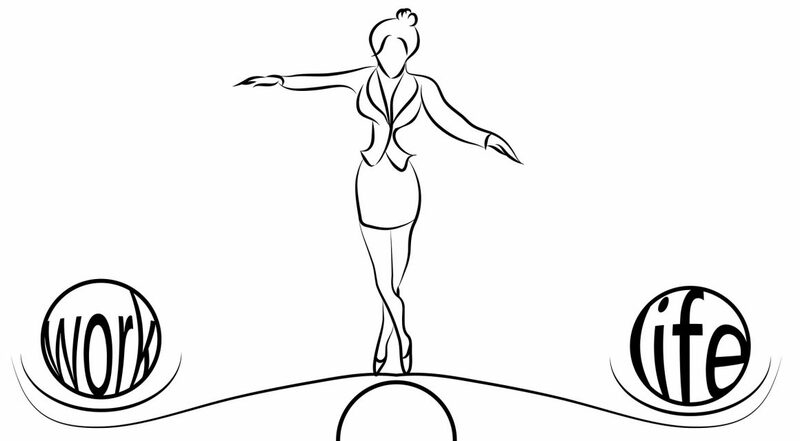 Indeed as corporate women’s development programmes encourage women to find their authentic leadership style we must embrace Balanced Leadership as ours. In this way we continue to #PressForProgress as we skilfully combine our journey to the boardroom with other aspects of our lives. Friedman’s approach is to do something new for a short period and see how it affects all aspects of our lives (work, home, community and self). If it doesn’t work out, stop or adjust, and little is lost. If it does work out, it’s a small win. Over time these add up so that overall efforts are focused increasingly on what matters most. Just as I did in this earlier blog, he recommends taking small steps that minimize the risks and enable us to overcome our fear of failure. Alimo-Metcalfe recommends linking our actions to our employer’s business objectives. So in pressing for more balanced working arrangements we are supporting the drive to encourage women into senior roles. And at the same time we’re enabling better work-life balance for everyone. We must embrace the fact that – as with previous cohorts of working women – it’s down to each and every one of us to #PressForProgress. We don’t need to wait for employers and we don’t need to wait for permission. We simply need the courage to ask. I started this blog for two reasons: Firstly my passion for and belief that work-life balance should be universally accessible. When we lead balanced lives we benefit and those around us benefit. Secondly – and as importantly – because the enduring lack of balanced working options at senior levels continues to block the progression of many women. Social attitudes towards parenting have been shifting rapidly but the belief that taking care of children – and elderly relatives – is still primarily a woman’s responsibility continues. As long as corporate cultures refuse to acknowledge the challenges this poses women continue to be forced to make choices between career and caring. Until now most of my posts have been written with working mothers in mind. So I felt it was time to acknowledge the increasing challenges faced by working fathers. Last month the American Psychological Association published research findings showing that men and women around the world experience similar levels of work-family conflicts. The struggles of men are – however – largely unreported. The role of fathers has shifted dramatically in one or two generations. Younger men generally want more day to day involvement in their children’s lives. Professor Caroline Gatrell of Lancaster University calls this ‘involved fathering’. And legislation is increasingly supporting them. For example, the UK recently introduced Shared Parental Leave. When they opt to become Balanced Leaders men face many of the same challenges faced by women. Men are also worried about how a desire for work-life balance will penalise career progression. And those entrenched social expectations make it difficult for them to talk openly about the issue. At the Wharton Business School Professor Stew Friedman has been running the Total Leadership Programme since the early 1990s. The programme guides and supports both men and women to balanced leadership in every area of their lives. Programmes like Stew’s are rare. Senior male role models are rare – although high profile men are beginning to step up as visible champions of balanced working. Men are being challenged to both redefine masculinity and the status quo of outdated corporate cultures. In many ways they are as much pioneers as the women I’ve written about in earlier posts. When we support men to be Balanced Leaders we support their wellbeing and we provide new role models for the next generation. And as Balanced Leadership slowly becomes the norm it will also positively benefit women’s career progression.